W.S. Gilbert was often portrayed as a gruff, prickly, disagreeable man, something he was quick to play up to, however this wasn’t always accurate. He didn’t suffer fools easily and often spoke his mind, making him confrontational –something that lost him several friendships and often caused rifts between himself and Sullivan. 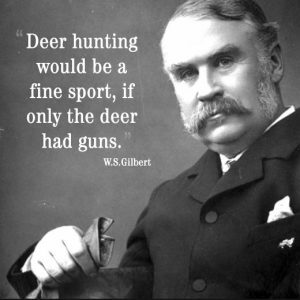 But Gilbert was a man of principle and he could also be incredibly generous. At the end of late rehearsals, he’d often pay cab-fares for all the girls to get home. He had a strong emotional attachment to the various animals at Grims Dyke, especially the ring-tailed lemurs and was once quoted as saying to William Archer ‘I have a constitutional objection to taking life in any form’. Gilbert and his wife, Lucy (otherwise known as Kitty), couldn’t have children of their own, but their affection for Nancy McIntosh was evident, with her becoming known as their unofficial adopted daughter. Gilbert was also popular with all of his friend’s children – giving them lavish chocolates, theatre boxes and throwing parties for them. The Gilbert’s generosity extended to the children of the village too, often giving out useful gifts at Christmas time. Although Lucy was 11 years his junior, they both settled well into life at Grims Dyke. Along with the frequent holidays, parties and dinners, both of them had a love for gardening; Lucy loved her flowers and Gilbert loved his fruit – he even noted details of each seasons first fruits in his diary! Gilbert and Nancy were also keen photographers, often taking photos of the parties and its subsequent guests. Gilbert was quite thin-skinned and quick tempered but, by all accounts, Lucy could hold her own. She may have been small and delicate-looking, but she was not as subdued and submerged as imagined. She could make her weight felt and, in a soft way, wore the breeches. Gilbert was known to hide the odd gambling failure, for fear of Lucy finding out and it is quoted she put her foot down over how many dogs he could have. The collaboration between Gilbert and Sullivan was often marred by disagreements and this came to a head with the infamous ‘carpet quarrel’. It’s understandable that they wouldn’t always see eye-to-eye, as they were opposing personalities – with Gilbert being confrontational and Sullivan avoided conflict. They also saw each other’s work dominating their own. But in April 1890, Gilbert challenged Carte over production expenses – including the cost of a new carpet for the Savoy lobby. Gilbert felt Carte was swindling them, but Sullivan both disagreed and took offence to the way Gilbert had spoken to Carte. They ended their collaboration and refused to work with each other. It took mediation between them and music publisher Tom Chappell, to bring the feud to an end. Gilbert’s quick wit was evident in his writing and illustrations, his prickly personality and need to speak his mind, was often too obvious – but it was his generosity and passion for his family, friends and pets that truly illustrate what kind of man he really was.